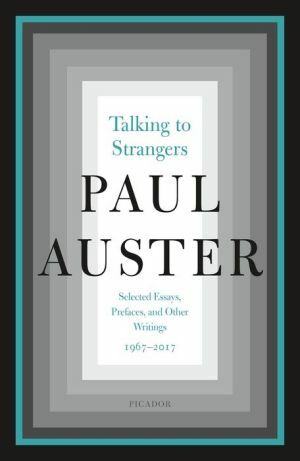 Talking to Strangers is a freshly curated collection of prose, spanning fifty years of work and including famous as well as never-before-published early writings, from 2018 Man Booker Prize–finalist Paul Auster. Beginning with a short philosophical meditation written when he was twenty and concluding with nine political pieces that take on such issues as homelessness, 9/11, and the link between soccer and war, the 44 pieces gathered in this volume offer a wide-ranging view of celebrated novelist Paul Auster’s thoughts on a multitude of classic and contemporary writers, the high-wire exploits of Philippe Petit, how to improve life in New York City (in collaboration with visual artist Sophie Calle), and the long road he has traveled with his beloved manual typewriter. While writing for the New York Review of Books and other publications in the mid-1970s, young poet Auster gained recognition as an astute literary critic with essays on Laura Riding, John Ashbery, Samuel Beckett, Franz Kafka, Paul Celan, and others. By the late seventies and early eighties, as the poet was transforming himself into a novelist, he maintained an active double life by continuing his work as a translator and editing the groundbreaking anthology, The Random House Book of Twentieth-Century Poetry. His prefaces to some of these books are included in Talking to Strangers, among them a heart-wrenching account of Stéphane Mallarmé’s response to the death of his eight-year-old son, Anatole.